Chosen by: This choice came about due to some confusion with “The Light Between Oceans”, a previous book club review. This critically-acclaimed novel won the Pulitzer Prize, was a National Book Award finalist, and a 2-year New York Times bestseller, among many other accolades. Set against a backdrop of World War II, we experience two very different storylines. Marie-Laure is a young, blind French girl, who is forced to the walled citadel Saint-Malo with her father to live in her reclusive uncle’s house when the Nazis occupy their home town of Paris. Marie’s father works at the Museum of Natural History, and he must protect the museum’s most valuable jewel—a jewel the Nazis want due to a fairy tale about it. In contrast, Werner Pfennig is an orphan who lives in a German mining town with his sister. They find inspiration in an old radio, listening to news from around the world. When Werner learns how to fix and build radios, he is enlisted in the Nazi Youth due to his skills. As the war escalates, we see normal people trying to live their lives in this difficult environment. As the novel progresses, Marie-Laure and Werner’s stories merge, though not in the way you think they will. Doerr took ten years to write this book, and his efforts certainly paid off in the believability of his characters, the strength of their relationships, and the vivid, detailed descriptions of each setting. To say it’s “well-written” somehow isn’t strong enough. His baddies summon real hate, his goodies follow paths that are truly moving. The relationships between Marie-Laure and her father and uncle are wonderful. His descriptions are so evocative that they transport you to France and Germany (in fact so convincingly that I forgot I was in a Japanese train station as I read it). Despite being difficult to get into at the start, the novel grabs you—with short chapters that make it a gripping page-turner, pardon the cliché. There are harrowing times, tense moments, and flashes of hope. Although All the Light We Cannot See isn’t uplifting, and at times feels a little bleak, it’s one of those books that should be read. Could it have ended a little sooner? Perhaps. Would it have been nice for a little more happiness? Maybe. But this is the reality of war. The acts of defiance from normal people were reminiscent of Alone in Berlin (a previous book club favourite). And there are magical moments—moments of light—even when it seems like there are none. 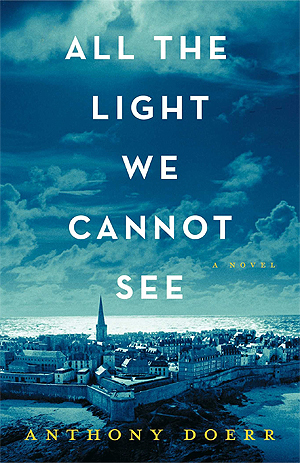 If you’ve read All the Light We Cannot See, feel free to score it out of 5 using the star rating above.